Our Honeys have enjoyed creating and exploring a small world farm this week. 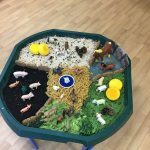 They used a variety of resources including feathers and green rice for the grass, porridge oats for hay, weetabix for hay bales, compost and glittery water for the duck pond. The children had great fun creating this along with their special carer, they confidently identified the names of the animals, discussed where abouts on the farm they should live and the food they thought they might eat.